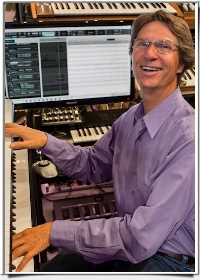 Multi-keyboardist Jim Oliver is an Emmy Award winning musician, dynamic performer and composer of more than 3500 hours of transformational healing music. Jim is a much sought after composer and musician and has provided music for more than 35 years for massage, meditation, yoga, gardens, children, pets/animals and deep personal growth. He played live music at the United Nations Church Center and was invited into the UN meditation room for a special World Peace meditation. Jim’s engaging music invites the human spirit to remember how awesome and divine it truly is. His music can help to restore balance and harmony to the body, mind, spirit and emotions and additionally integrate cellular healing and coherence. You are indeed limitless, even when operating in a seemingly “limited” physical reality. How Jim’s music creates a vibrational model of you in your optimal state that you can resonate with and use to open the infinite flow of Abundance – True Freedom – True Liberation. Unravel entanglements from old programming which can cause a false perception of lack. Remove blockages that restrict the connection to Your True Self. Release stress. Reorganize your energy back into a state of harmony and balance. Positively affect DNA. Use Jim’s music to achieve your clear intentions, access new potentials and possibilities and expand consciousness.